Of course, the real rationale behind US President Barack Obama's sudden and very aggressive push towards starting a new war against Syria are not for us-the-people to know. In the end, our "democratic" system of government always results in a dictatorial executive, wielding human and economic destruction, free from consequences for the destroyer. Institutions that may wield limitless power without price attract the most power-hungry and irresponsible members of humanity. Political systems based on coercion and force (in the case of democracy, the right of the majority to coerce the minority) always result in much more coercion and force than one bargained for. Even though Obama does not share with us mere mortals the reasons why he does what he does, astrology can shed some light on our Supreme Master's murderous motivations. We outlined the commander-in-chief's homicidal leanings in this discussion of his natal chart. 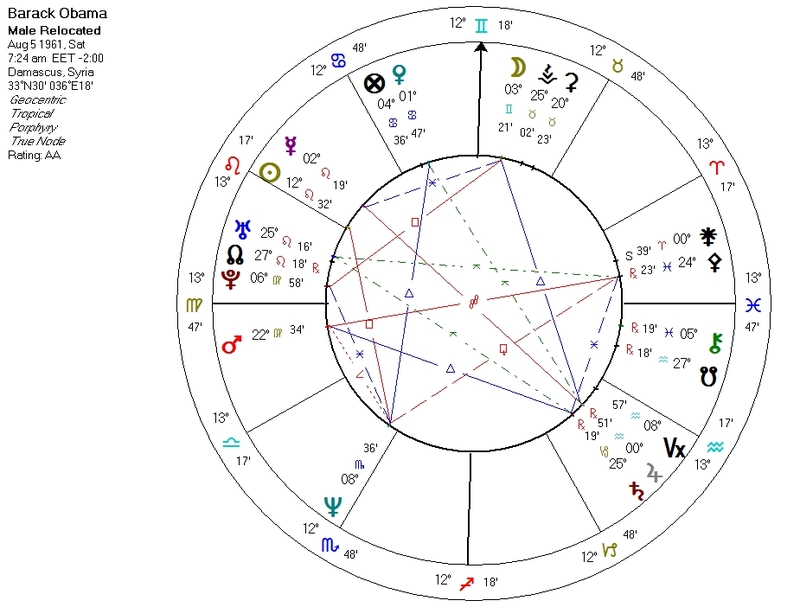 Today we look at his current astrological weather, and compare his chart to that of the soon-to-be-destroyed Syrian regime. 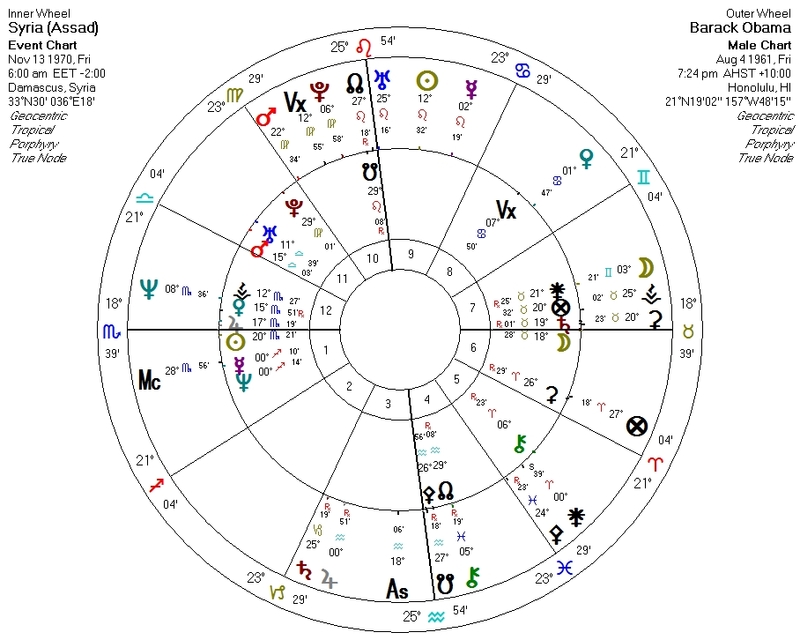 First, a snapshot of Obama's current transits, progressions, and solar arc directions hints at why he might now be especially inclined towards killing. This chart is largely arbitrary: the purpose is to get the positions of the slower-moving bodies. Transiting Pluto semisquare natal Pallas: makes killers more likely to kill. Transiting North Node conjunct Solar Arc Mars in Scorpio: amped-up aggression. By the way, Obama's solar arc Mars is exactly conjunct Syria's progressed Mars and solar arc Pluto. Transiting Uranus trine natal Sun: amped-up impulsiveness. Transiting Pallas conjunct solar arc Moon: a fighter's aspect. Transiting Mars conjoining natal Mercury: violence is on his mind. Transiting Saturn conjoining Obama's 9th House Neptune: The President's legendary ability to fool the public, impeded. Transiting Neptune square Obama's Moon: Obama's "family", the nation, alienated. Transiting Saturn semisquare Obama's Mars: Action, impeded. Obama's Uranus on Syria's MC: Obama brings "Change". Regime change. 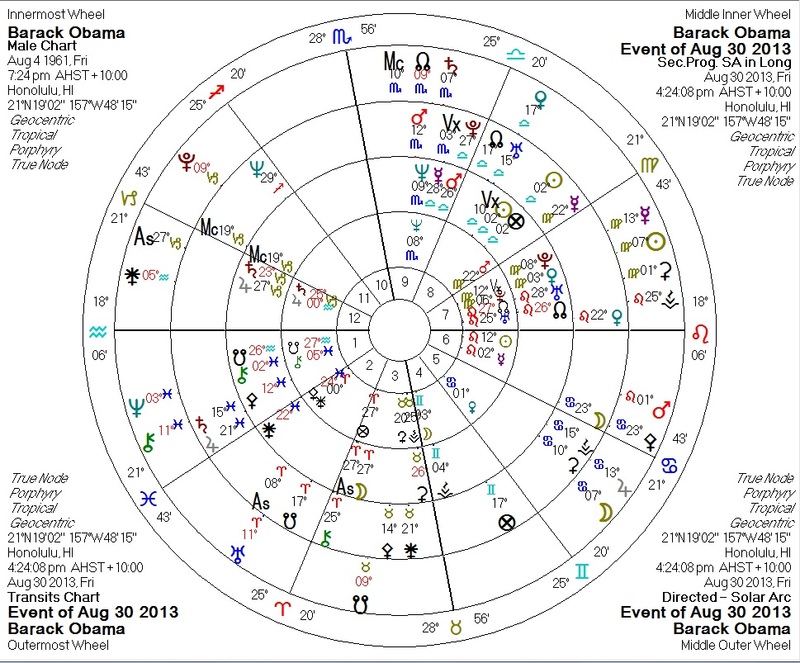 Obama's Uranus square Syria's Sun and Jupiter: Jupiter rules Syria's 2nd house, and the Sun rules Syria's MC. So not only does Obama disrupt the Syrian government, but its economy as well. Obama's Pluto square Syria's Mercury and Neptune: Mercury rules Syria's 8th and 11th houses of death and society. Neptune rules Syria's 5th house of self-image and self-expression. Obama brings death, then, to the Syrian public and its self-expression. Obama's Neptune conjunct Syria's Venus: Liquefying Syria's wealth and resources. Obama's Mars quindecile Syria's Chiron: Bringing the hurt. Syria's Pluto opposite Obama's Pallas: Syria just brings out the killer in Obama. Not that it takes much. Yes, that's right -- Pluto and Mars rising, with the Ascendant at their midpoint. Make no mistake, peoples of Syria: Barack Obama is not your friend. Syria is the Middle East's last secular regime. If recent history is any indication, Syria too will soon be overrun by violent Islamic radicals if the US destroys its secular state. This will exacerbate the disaster that is Middle East politics and provide yet more rationale for Western intervention into the region. It may even start World War Three outright by pulling Syria's ally Russia into the fray.